PRF-930 Powder Fixture meets requirements of “Technical Recommendations of National Institute of Occupational Safety and Health JNIOSH-TR-No. 42 (2007)". 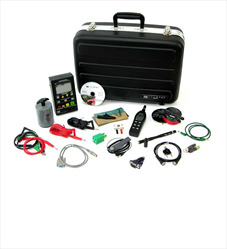 The PSK-310 Kit is the choice of advanced professionals and the ultimate in advanced auditing and material testing. 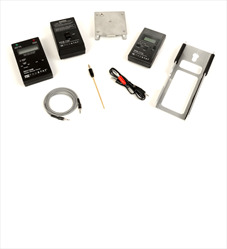 The PSK-310 includes all of the equipment in the PAK-210 Kit and adds the Prostat PRF-911 Concentric Ring Fixture and the PTB-920 Dual Test Bed for surface and volume resistivity measurements of packaging and other flat materials. 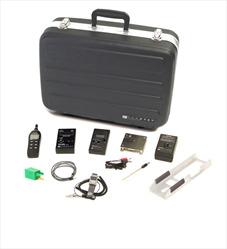 The PAK-210 ESD Auditor's Kit expands your measurement and audit capabilities. 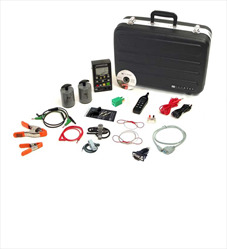 The Basic System Kit includes all of the equipment in the PFK-101 and PMK-151 Kits and adds the necessary equipment for testing wrist strap and footwear checkers, advanced ground and electrical circuit assessment and detailed wrist strap audits. 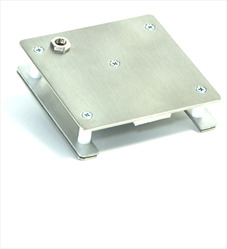 The CPM-720A Charge Plate Assembly is a miniature isolated plate attachment for the PFM-711A Field Meter. 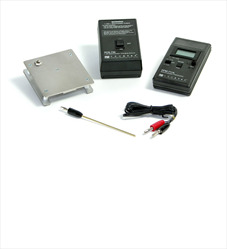 It converts the PFM-711A Field Meter into a portable, battery operated charged plate monitor (CPM). This unique design allows precision balancing of ionizing blowers and other devices to less than ±2 volts accuracy. 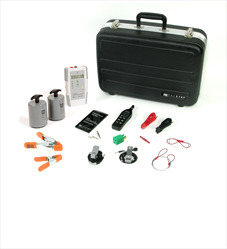 The PMK-152 Floor Resistance Test Kit contains the instruments you need to take resistance measurements. 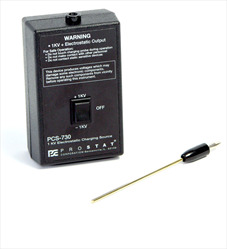 The PMK-152 includes Prostat's PRS-812 Resistance Meter with 5 pound conductive rubber electrodes. You can take measurements at 10 and 100 volts with accuracy within ±5%. To measure temperature and humidity, the Prostat PHT-771 Digital Psychrometer is also included. The hand-held PFM-711A Fieldmeter is an instrument used to perform static surveys and polarity on objects with accuracy of ±2% at ambient conditions (23ºC and 30%Rh). This stabilized chopper can be used in environments with a presence of ionization without drifting. 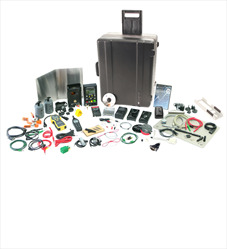 The PIK-110 Ionizer Test Kit contains all the instrumentation included in the PFK-101 as well as advanced equipment making it the most comprehensive portable ionizer test equipment available. 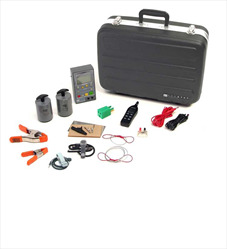 The PMK-151 Basic Measurement Kit has all the functionality of the PMK-152, but adds computer downloading capabilities. 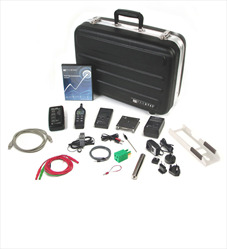 It contains all the instruments you need to take a variety of resistance measurements. Use the PRF-911 set to measure surface resistance and volume resistivity on extruders or planar sheets, foam, ESD corrugated, wafer separators and foam wraps Use the PRS-801-W electrodes for measuring across the web of large extruded plastic sheets and foams. Use the PRF-922B to measure vacuum formed polymers, AirCap or Die-Cut cavities, Polyethylene or cross-linked foams All packed inside a carrying case for easy storage and transport. 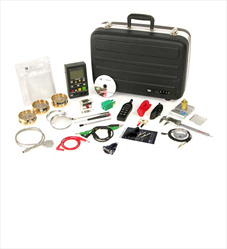 This kit is perfect for developing new materials or verifying existing products. 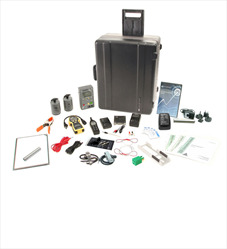 The PGA-710B is a unique electrostatic data analysis device for use with the PFK-100 Fieldmeter/Charge Plate Monitor Set. It records, plots, analyzes and automatically constructs reports of body voltage generation, electrostatic decay, voltage retention, ionizer performance and other static measuring functions. 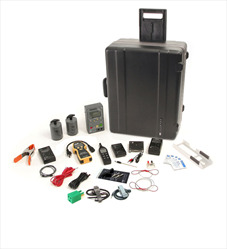 The PCS-730 Charging Source is a battery operated hand held device used to charge an object up to ±1 KV. The PCS-730 is designed to be used in conjunction with the Prostat PFM-711A Field Meter equipped with the Prostat CPM-720A Charge Plate Assembly. 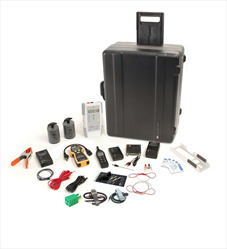 The PPA-400 ESD Process Analysis Kit is for advanced professionals who need materials testing, facility evaluation and process analysis capabilities all in one kit. 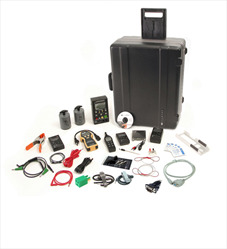 This integrated kit has everything in one case for full evaluation of a companies' ESD program and process. 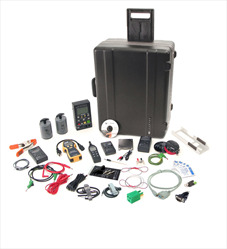 The PFC-252 Professional Floor Certification Kit is specifically designed for anyone who is verifying floor performance to ANSI/ESD S20.20, IEC 61340-5-1, or other company requirements. 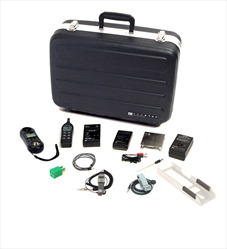 Like the PSK-310, the PSK-312 Kit is the choice of advanced professionals and the ultimate in advanced auditing and material testing. 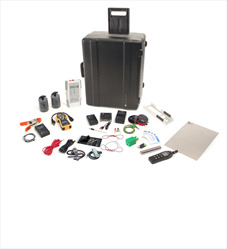 The PSK-312 includes all of the equipment in the PAK-210 Kit and adds the Prostat PRF-911 Concentric Ring Fixture and the PTB-920 Dual Test Bed for surface and volume resistivity measurements of packaging and other flat materials.